Hot on the heels of the cult-like success of the Jesus Phone, Apple asked itself, "what would Jesus Phone do?" or W.W.J.P.D. It looks like the answer is the raising up of a lesser god for idol worship priced in the $300 range. 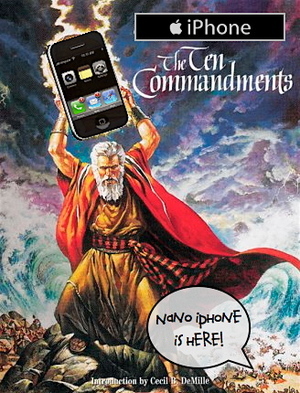 Yes cult members, it's almost possibly true, it's the Nano iPhone. Will it be sleeker, cheaper and sweetly priced for the KAPOW! generation? The throngs of followers are restless. Reserve your place in line now to know for sure.